Lane Johnson won’t be playing in Sunday night’s game. 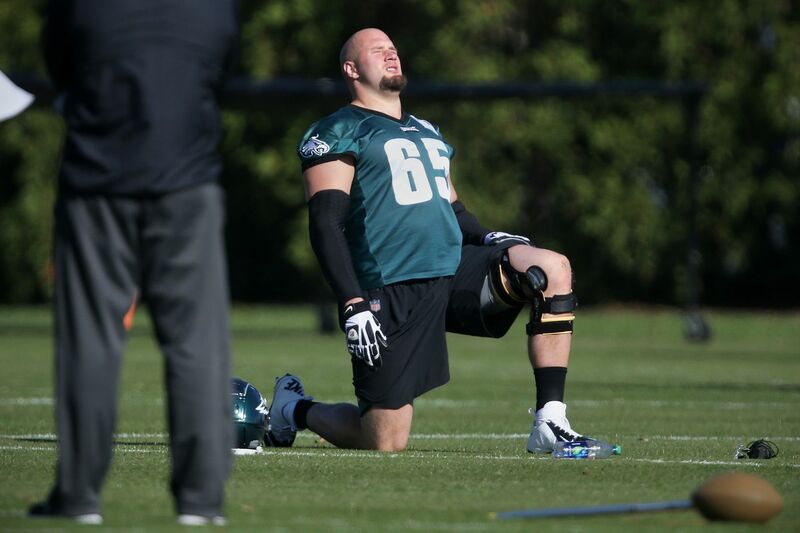 Lane Johnson is inactive for the Eagles' game against the Dallas Cowboys on Sunday despite hope this week that he wouldn't miss any time after suffering a torn MCL on October 28. Johnson, who was limited in practice leading up to the game, was listed as questionable for the game. Halapoulivaati Vaitai will start in Johnson's place. The Eagles' other inactives are safety Deiondre' Hall, cornerbacks Sidney Jones and Jalen Mills, offensive lineman Matt Pryor, running back Darren Sproles and quarterback Nate Sudfeld. Defensive end Josh Sweat is active even though he was questionable with a hip injury. Jones (hamstring), Mills (foot) and Sproles (hamstring) were all declared out leading up to the game. Hall is a healthy scratch for the first time this season. Pryor and Sudfeld are also healthy scratches. The Eagles have rookie Jordan Mailata active on Sunday as an offensive tackle. The Eagles are also getting Corey Graham back after he missed time with a hamstring injury. Cre'Von LeBlanc is making his Eagles debut. Johnson did not work out on the field prior to the game.